Production line - OCA SFORZESCA S.r.l. 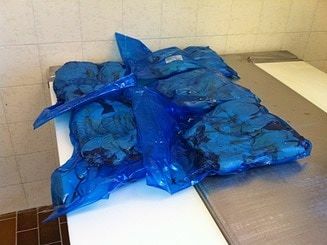 Within only 24 hours from the slaughtering all the goose meat is packed under vacuum and reaches the factory into a pallet box with a temperature below 4,5 °C in top microbiological condition. 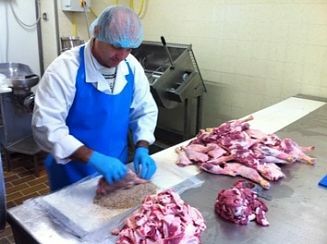 At every supply we check the goose meat which has to meet strictly the Oca Sforzesca’s standards. 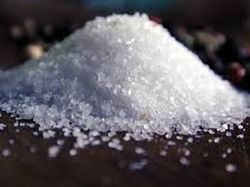 All our products are made with Cervia's sea salt. This salt is free of additives, especially Potassium ferrocyanide (E 536). It also has a low content of bitter substances (sulfates) and is rich in trace elements including iodine. 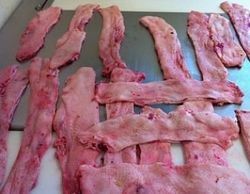 So it improves the quality of our goose salami and they also have a significant reduced salt content compared to other cooked and cured products. 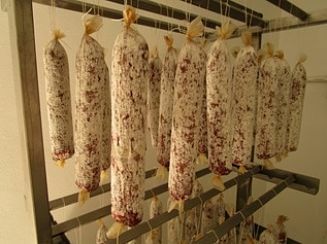 All our cooked and cured salami are wrapped with their goose skin case. The goose skin is cut and sewn by hand as per the local tradition. The stuffing and tying are done by hand to obtain the characteristic shape, expression of authenticity. The products are made by hand according to a traditional recipe passed down from father to son for three generations, this ensures traditional tastes and flavors. The traditional hand made production is combined with a modern food quality management system, as the blu BRC cloths and correct human hygiene procedures. The blu clothes and equipment are useful to detect immediately if accidentally there is a piece of them in the process. This way we significantly reduce any risk of external material in the final product. In the curing section we only use stainless steel instruments and food plastic as a further guarantee towards our products and our customers . To ensure traceability we use blu BRC tablets which follow the lot number from the production to the packaging.